The Jolly Sailors01485 210314work Public HouseThe Jolly Sailors is a real gem - it has it all. It is said that many a smuggler along the coast in days gone by, enjoyed a pint or two at the Jolly. It is a truly village pub, where seafarers, fishermen and locals will always be heard telling a yarn or two over a pint and a bowl of local mussels. Recently restored to its former glory but still retaining its unique character, the pub comprises a welcoming locals bar with wood burning stove, serving its own real ales (Brancaster Brewery) as well as others from the region, comfy dining areas inside and outside terrace, pool table, darts board, bar games and big screen TV in the back room. There is an enclosed garden with children's play area and plenty of parking. Local produce where possible sourced for the homely menu and a stone based pizza oven where you can choose your own pizza toppings - all day dining in the spring and summer months. 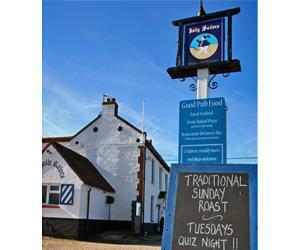 It's a lively pub with quiz, themed and local live music nights. And an annual local beer festival in June each year. The Jolly Sailors is a real gem - it has it all. It is said that many a smuggler along the coast in days gone by, enjoyed a pint or two at the Jolly. Not forgetting nearby to Brancaster beach, Brancaster Staithe harbour and the Norfolk Coastal path with stunning views across tidal marshland.